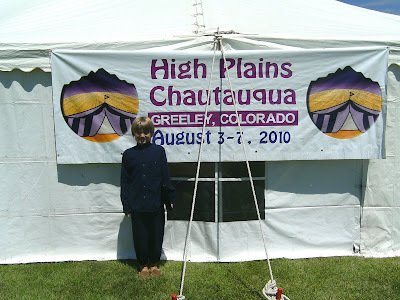 Welcome to the eleventh annual High Plains Chautauqua, a living history festival that recreates the traveling tent Chautauqua tradition of the early 20th century. This year’s unique blend of theatre, history and the humanities will feature portrayals of fascinating Americans who delight us, infuriate us, scare us, dare us to think big, inspire us to stand up for what we believe, challenge us to rethink our preconceptions, and make us laugh. Can we rise to their challenge? Can we learn from these extraordinary Americans? Can we chime in with them, giving voice to a new American chorus of limitless possibility? President Theodore Roosevelt once called Chautauqua the "most American thing in America". The traveling Tent Chautauquas were an outgrowth of the lyceum movement and evolved in the early twentieth century to bring to rural America the same quality of entertainment, history and culture that was available to city dwellers. The Circuit Chautauquas were modeled after the Chautauqua Institution in southwestern New York state, a community with summer long programs by politicians, writers, theologians, and musicians. I was very excited to learn that our eldest grandson was portraying George Washington in one of the many Chautauqua events in Greeley this summer. Living history at its best. This old history teacher couldn't be more pleased.